If the air speed remains low for an extended period of time, dust accumulations can form within the duct work. These accumulations further choke the system and in turn decrease airflow/suction making the problem even worse. This will cause a loss of suction at pickup points and drops throughout the dust collection system. Loss of suction will mean lower hood velocity, potentially falling below the industry recommended capture velocities required for the material being collected. Without adequate capture velocity at the collection hoods, these areas/processes may begin to develop production problems and industrial hygiene issues (especially important for hazardous materials such as heavy metals, biosolids, allergens, etc.) due to the excess dust not being vented adequately. Several factors either isolated or in combination can lower the air velocity and the dust collector particle velocity in the system. These can include blinded bags, poor conditions or improper setting of the cleaning system, wrong filter media for the application, undersized collector, and process changes among others. However, in most cases the greatest challenge is recognizing the importance of conveying velocity and having a method to detect insufficient air speed BEFORE it begins to cause problems. 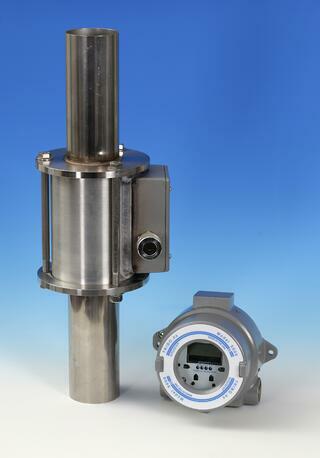 One such method is an Auburn Systems Triboelectric Particle Velocity Monitoring System, such as the Auburn TRIBO.hs 5000. Using Auburn’s triboelectric dust detection technology, the monitor can accurately measure the speed dust particles are traveling between two insulated metal probes in the ductwork. This measurement of actual particle velocity (versus air velocity) results in an accurate reading that operators can then use to monitor conditions in the system. Any drop in velocity can be set to trigger an alarm, allowing maintenance personnel to take corrective action immediately thus preventing any of the problems discussed above before they even begin to form. The reasons for monitoring particle velocity in your dust collection system or baghouse are compelling. Low air velocity (1) decreases effectiveness of venting at all sources and (2) can lead to creation of dust accumulations within the duct that can increase exposure to higher than acceptable dust levels for workers or cross contamination of materials and finished products. Interested in learning more about the benefits of monitoring particle velocity in your dust collection system? Contact Auburn Systems today!